Wake up call at 6:00 AM brought the team into racing mode to 'Coco Rice-Crispies' in the hotel. Scrutineering began at 9:00 and really went underway about a half an hour later. The day really began as we braved the scooter lanes in our solar cars to get to the National Science Museum for the inspections and tests. When we arrived at the museum, the cars lined up in a circle outside the building, and the race officials ripped us through the different tests one team right after the other. As we were traveling to the museum, the brake lights were not functional. The car passed all the tests save the brake lights, and Jason and Sam fixed a relatively simple problem in the circuit board in time before the end of the day. W're now licensed and ready to race! Pat receives Borealis 3's license plate. The scrutineering team poses with the car. As for rest of inspections, the NASC rules left us more than prepared. The car stopped in less than half what was allotted in the brake test, battery and electrical systems were well prepared to face any of the challenges we're going to find here in Taiwan, and the team was ready to answer more than the officials wanted to ask. After a few grocery runs and a laundry run, we went to the official kick-off dinner. Between lunch and dinner, today, we saw a feast including shrimp, abalone, shark fin, pork, lamb, chicken, fruit of all kinds, shapes, sizes, and an entire spread of cakes and pastries. 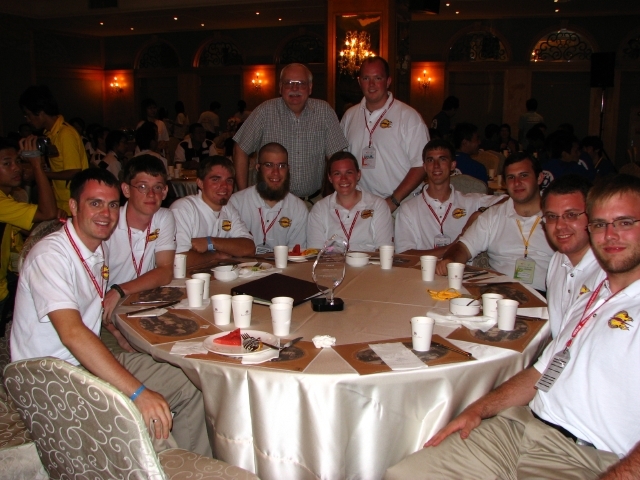 Speaking at the dinner, Hans Tholstrup, the founder and honorary chairman of the World Solar Challenge in Australia, put it rather well when he said, "Taiwan may not have had the first solar car race event, but it certainly is the classiest." Sam and Pat guide the car through battery inspection. The team gathers with the trophy that was presented to us.